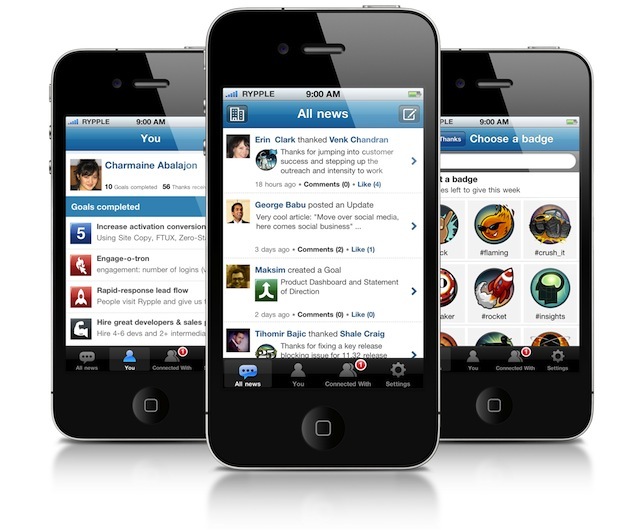 The Web-based social performance platform Rypple is now available on the iPhone, the company is announcing today. Like the desktop-sized website, the new mobile application will allow managers to give real-time feedback to staff, provide coaching, track goals and publicly recognize colleagues for doing great work. The idea behind Rypple, which sees itself as a “Zynga for the enterprise,” is to use social software in the enterprise environment to build a great work culture. It does this by allowing managers to track projects, guide their team and give kudos to deserving staff for others to see within its online application. The software also employs various game mechanics, like badges, which can be custom-built to reflect a company’s own values. And, as in gaming, employees can rack up “skills earned,” in a method reminiscent of building up a character in a virtual world or MMORPG, for example. With the new iPhone application, users can track the company feed for news, update teams on the status of a project, post “thanks” and hand out badges. The app will be available as a freemium offering. There’s a limited free version, a $5 per user per month version that offers access to goals, real-time peer feedback, 0ne-on-one coaching and recognition, and a $9 per user per month version that includes Rypple’s rapid performance review application, Loops, support, rollout and integration into existing company work systems. The app is available here in iTunes now.